We have dreamed for years about road tripping around this great country of ours once we retired. We finally did retire two years ago and are living our dream. We have been on a number of road trips but haven't gotten a chance to venture too far from our home in North Carolina and snowbird home in Florida. This year will be a very busy year for us as our first grandchild is due in April and our youngest is getting married in September. These glorious events will keep us close to home but we are looking forward to road trips we will be taking next year. 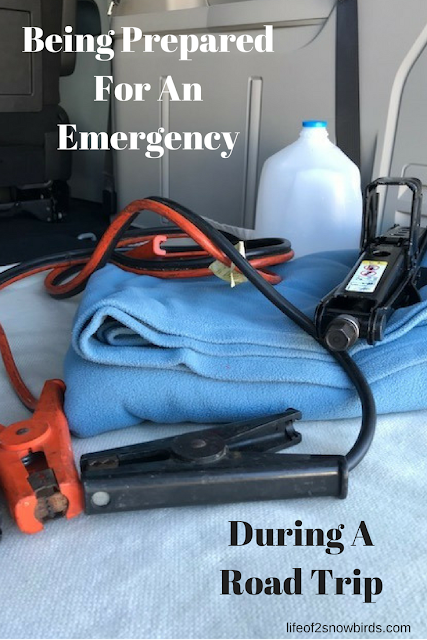 We always prepare our car before we hit the road and you can read about how we do that in our recent post. But a story we heard a couple of months ago about an elderly couple getting stranded in Grand Staircase Escalante National Monument when their rental stalled made us think beyond just getting our car ready. Most of our road trips will revolve around seeing as many National Parks as possible. We have been to a few and have enjoyed each of them and look forward to enjoying a few more. The story of this Houston couple made us think about the possibility of getting stranded in one of these parks. We know that help is not a cell phone call away in places where there is no cell tower around for miles. We would have only ourselves to help us out of an emergency situation. We will have more success helping ourselves if we are prepared. We decided that we need to arm ourselves with an emergency kit to keep in the car before we hit the road. The couple that I mentioned above were rescued 6 days after they became stranded but were severely dehydrated. We were thinking of what we would need to survive for a couple of days. We have come up with this list. Essentials- Store these items in a backpack and leave in car. Water. Gallons, bottles or small boxes. Non-perishable food items. Also, granola bars and power bars. Extra Necessities - Store these items in a bin and leave in car. First Aid kit - containing different kinds of bandages, sterile wipes, scissors, tweezers, gauze and instant cold pack. Flat tire kit - including temporary tire sealant. I think that once we secure these supplies we will be ready for any emergency on the road. I will look on the My Patriot Supply website for everything I need. They not only have survival supplies you would need to have on the road but My Patriot Supply has supplies for many other emergency situations. Also, a good idea is to leave your, detailed as possible, itinerary with a loved one. Check in on this person with a quick text from time to time when you have reception. They will be the ones who will alert authorities if they have not heard from you after a period of time. We were very fortunate that when we got a flat tire in the middle of the night, in the middle of nowhere and in the middle of winter, that it happened in front of the only house for miles around. A very nice gentleman, still dressed in his postal uniform, came out of his house with a flashlight and helped Soko put on the spare. So we know firsthand that things can happen and we need to be prepared when they do. Great tips! Thanks for linking up at Friday Frenzy Link Party! PINNED! Wise words. I never thought about being in a place like a national park with no cell reception. And it's great to check it every day with someone and let them know your plans for the day. Glad you learned something from my post! These are excellent tips. I always keep bottles of water, snacks and blankets in my car. I better step up my game and put add some of the other items to my list. Thanks for sharing on Sunday's Best.